BASIC PREMISE: A documentary about Jimmy Mirikitani, a homeless Japanese-American artist who completely lost touch with his family after World War II. 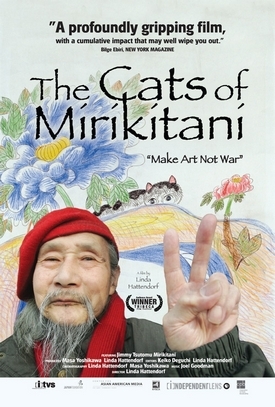 ENTERTAINMENT VALUE: There’s much more to 85-year-old Jimmy Mirkitani than meets the eye, which makes The Cats of Mirikitani the most surprisingly engrossing film since 51 Birch Street. At first, long-bearded Mirikitani seems nothing more than a homeless man with a gift for drawing things, such as cats, which he sells to people who pass by him in Washington Square or, in the wintertime, under a grocery store awning. The more he talks to the camera, the more he reveals very interesting facts about his past, such as that he was born in Sacramento, California in 1920 and then moved with his family to Hiroshima, Japan. Eventually, he moved back to California to pursue his dream of becoming an artist, but instead, he ended up being forced to spend time in a WWII internment camp. Meanwhile, many of his relatives, he recalls, died in the atomic bombing of Hiroshima and he lost touch with remaining relatives since then. When director Linda Hattendorf warmly lets Mirikitani move into her apartment on September 11th, 2001, she gets to know him even more. Therefore, you gradually care and warm up to him as well. In a colorful anecdote, it turns out that he was once a chef for Jackson Pollock, who, Mirikitani claims, had a strange appetite to eat lots of sushi and tempura every day. When Hattendorf stumbles upon a newspaper photo with another Japanese-American bearing last name of Mirikitani, that’s when The Cats of Mirikitani becomes a compelling quest to find out who this woman is in relation to Jimmy, to reunite them, and, somehow, to get him welfare benefits so that he can have a roof over his head—he doesn’t have social security, yet, though. Even though Hattendorf includes herself through the film, she never loses focus on her quest, which inevitably becomes Mirikitani’s own personal endeavor. At a running time of only 74 minutes, it never overstays its welcome. SPIRITUAL VALUE: Other than the important, inspirational message of confronting your past no matter how painful it may be, The Cats of Mirikitani will inspire you to avoid the temptations of narcissism by simply inquiring about other peoples’ pasts. You never know what you will ultimately discover until they open themselves up to you. It could be quite revelatory and even mutually therapeutic, no matter how different your backgrounds/cultures seem. It’s also a good way to make a new friend for life. IN A NUTSHELL: Warm, engrossing and inspirational. An indie gem.